Reduced Price! !Perfect secluded land. Located in Punta Pargo on the mainland near Shepherd Island (Isla Pastores). 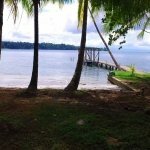 It is a 35-minute boat ride to Bocas Town and a 25-minute ride to Almirante on the mainland. Approximate 24 hectares, 6 hectares has been titled and the rest is clean ROP property due to long-term ownership. There is a nice calm beach where you can pull up your boat. The property has great elevation for build sites. There are tropical hardwoods as well as tropical fruit trees planted on the property. There is 10 acres of cacao planted for a cash crop. There is a nice snorkel reef in front of the property. There are several great building sites for several homes. If you are looking for acreage that you can feel spread out and also be in calm waters, check out this hideaway. Bring offers!